Today’s NFL frequently sees a bevy of pass-happy offenses on the field, attempting to spread defenses wide and connect on passes all over the field at a higher volume than every seen before. The evolution of the game has made the cornerback position more important, and popular, than ever. 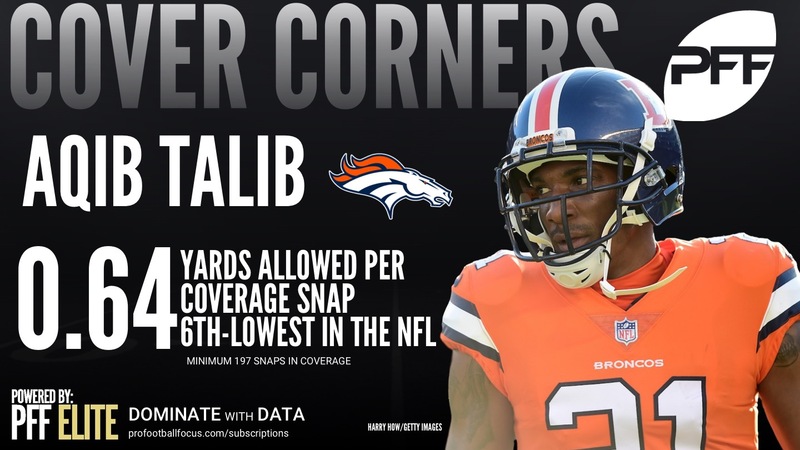 At PFF, we track every snap a cornerback is in coverage, among every other facet of a corner’s game, and with that we can accurately depict just how stingy the league’s CBs actually are in terms of allowing receptions to their primary receiver. 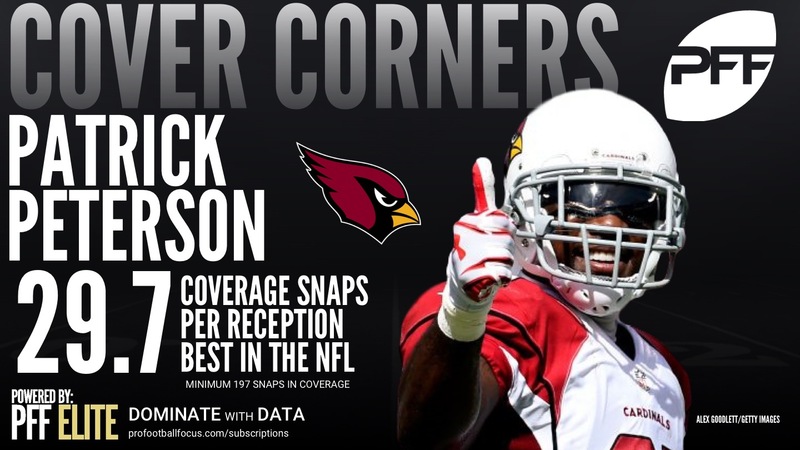 The top 10 cornerbacks in terms of most snaps in coverage per reception allowed are led by none other than All-Pro Patrick Peterson, who is having another great year in Arizona. Peterson has been the gold standard for corners so far this year as far as shutting down their man. Quarterbacks rarely even look Peterson’s way when he’s in coverage, throwing at him just once every 11.1 coverage snaps. That’s the third-best mark in the NFL. When they do look his way, they are far more likely to see the pass fall incomplete than be caught. He’s allowed just 12 completions all year (32 targets) and has five pass defenses to just one touchdown allowed. Peterson has allowed one catch or fewer in five of the nine games he’s played so far this season. Amukamara missed the first two games of the season due to an ankle injury, but since he’s come back, he’s helped anchor a surprisingly impressive Bears secondary. Amukamara has been targeted least frequently among all qualified corners this season, at an average of once every 13.9 coverage snaps. His nine receptions allowed on 16 targets are both the fewest among corners with at least 200 coverage snaps this season. He also has three pass breakups on the year. His playmaking numbers will never look too impressive because quarterbacks simply just avoid throwing at him rather than risk his tight coverage. 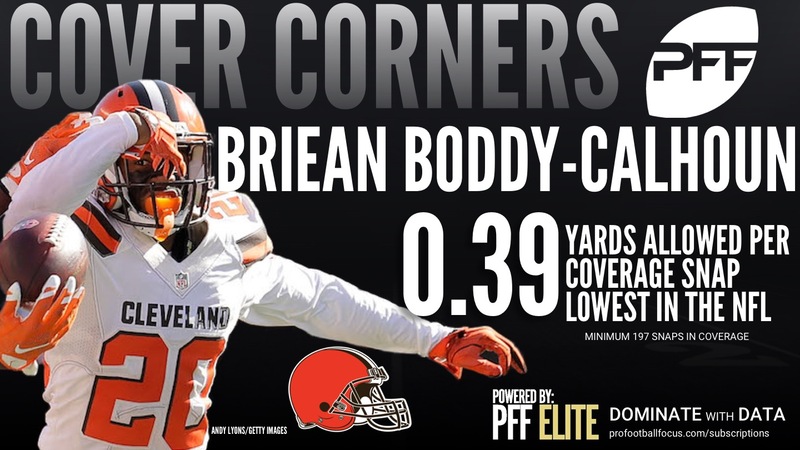 Boddy-Calhoun has been quite impressive this season for the Browns as a versatile corner that can play both outside and in the slot. He’s allowed just 10 receptions this year (19 targets) and surrendered a mere 90 yards on those catches. His 0.39 yards per coverage snap allowed is the lowest average in the entire NFL. He has five pass breakups on the year, and has allowed just one touchdown. Williams makes up part of one of the best CB duos in the league for the Chargers. This season he’s allowed 19 catches on 39 targets for 238 yards, with one touchdown allowed and one interception. Williams is surrendering an average of 0.69 yards per coverage snap, which is the seventh-best mark in the NFL. He has also made seven pass breakups and has allowed a first down or touchdown on just 27.5 percent of his targets. Despite being targeted more frequently than anyone on this list at once every 8.3 coverage snaps, Smith has been superb this season. Quarterbacks throwing at him have a rating of a mere 27.9 thanks to the 14-of-30 for 106 yards and zero touchdowns that he’s given up. He has two interceptions and another six pass breakups. His 0.43 yards allowed per coverage snap average is second in the NFL, and he also leads the league with just 15.6 percent of his targets seen going for first downs. While Sherman’s season is now over, he was continuing his play as a shutdown corner before even with an injury always nagging in the back of his mind. While his 19 receptions allowed for 302 yards may not seem overly impressive, it took opposing quarterbacks 41 targets to get there. Sherman has picked off two passes this season and broken up five more to help counter the three touchdowns he’s allowed. Sherman has also continued to be one of the best tackling corners in football, leading NFL corners with zero missed tackles on 38 attempts. Heyward makes up the other half of the Chargers’ excellent corner duo thanks to his nearly identical play as Williams. Heyward has allowed 316 yards on 20 catches this season, though he’s seen 39 targets. Heyward has an interception and eight pass breakups this year. He is also one of 24 corners this season that has yet to receive a defensive penalty. Despite his advancing age, teams are still clearly afraid of testing Talib too often. He averages 9.6 coverage snaps per target, which is the fifth-highest average among all NFL corners. He also allows just 0.64 yards per coverage snap, which is the sixth-lowest. While Talib may not have the numbers of old, with just one interception and five pass breakups to go along with three touchdowns allowed, he’s still playing at a high level. Trufant has been fantastic for the Falcons this season. He’s allowed 20 catches on 37 targets for 253 yards, but just 96 of those yards came after the catch. He averages 9.1 coverage snaps per target, which is the seventh-best in the NFL. He has allowed four touchdowns which isn’t a great number, but he’s also picked off a pass and broken up seven more. Of all Trufant’s targets that he’s seen, he’s only allowed a first down or touchdown on 27.7 percent of them.